Unlimited coming and going for 1 day or 15 days. More than 40 car parks and more than 13,000 parking spaces at your service. B:SM operates Barcelona’s largest network of car parks, securely operated and open 24 hours a day, 365 days a year. We meet your parking needs by offering a wide range of flexible season tickets for different time slots. You can choose the payment type that most suits you and enjoy many advantages. Park at more than 40 car parks and pay half price If you have a season ticket for the B:SM Network, use your card at the automatic machines and pay only 50% of the Pay-As-You-Go price at the other 40+ car parks across the B:SM Network around Barcelona*. For more information, see the section: Season Tickets. At B:SM, we have the solution to ensure that parking is not an obstacle to your business. Whether for you, your partners, your staff or your customers, we can help. This is the solution to ensure your customers and staff have no problems parking and make it easy for them to meet with you in your company or office. By the hour or part of an hour. For suppliers and distributors: Pre-Pay Cards. Customised parking solutions Making parking easier is a good investment. You earn money from it. For partners and employees: Personalised Season Tickets. A flexible and affordable system that suits the needs of your staff. Are you holding an event or meeting in your company? With your advertising: it’s best to be seen and heard! Thousands of people use the B:SM car park nearest to your business. Turn the car park into another shop window for your business. Spots, posters, flyers... and Enxarxa't! To make your parking cheaper, faster, more convenient and to meet your specific needs: Pre-Pay Cards (by blocks of hours): 25, 50 and 100 hours. 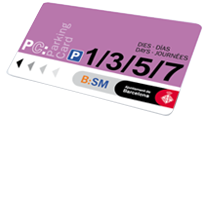 With B:SM’s Parking Card you can park anywhere within the B:SM network for 1, 3, 5 or 7 days.